Tony Lawrence's Coins & Stuff: "Liberty" Medals for 2015? 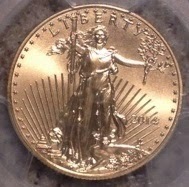 I read at Lou Golino's "The Coin Analyst" column that the U.S. Mint plans to issue an American Liberty ultra high relief gold coin and silver medal in 2015. I'm not generally interested in medals, but I might make an exception in this case as the gold coin will be too expensive for my budget. The silver medal would be more affordable and, although these will not actually be so, I see them as patterns for what should be on our coins. In my view, it's a shame that we started using portraits of people on our coinage in 1909. That "cult of personality" is something that our founding fathers were opposed to. It's true that their opposition was because of the royalty depicted on other countries coins and our presidents are not that, but even George Washington himself shot down the idea of using his portrait on our first coins. Certainly Washington, Lincoln, Jefferson and Kennedy deserve recognition. In the view of the founders, that's what medals were for. They felt that our money should use the symbols of the ideals that define our nation: Liberty and Union. The Eagle as a symbol of strength was added later, but for more than 100 years no person appeared on our coins. Oh, well. Trying to remove Lincoln or Washington now would undoubtedly cause great outrage, especially among the nations conservatives. If they know anything about history, they should be as opposed as I am, but that's not going to happen. I'm looking forward to this. We don't know what it will look like, but the idea of“to create modern images of American liberty and freedom that will leave a legacy of coin designs that reflect our era” is on the right track, I think.